We’re pleased to reintroduce some popular requests for TradeSkillMaster with the release of version 4.4.1 along with some updates and bug fixes from several releases since version 4.2. Check out some of the highlights! We’re sure the Crafting Search is a welcome return to TSM. This search mode allows you to search for both the crafted item and the material component at the same time. This will also work for milled, prospected or transformed materials. For example, searching for ‘copper bar/crafting’ will return Copper Bars and Copper Ore in the same results. Or alternatively, searching for ‘ashen pigment/crafting’ will return Ashen Pigment and the six Cataclysm herbs you can mill to produce the pigment. Separated out from the TSM3 version of this function, the Disenchant Search is now its own flag in the Shopping module. For example, searching for ‘temporal crystal/disenchant’ will search and return any items that disenchant into Temporal Crystals. Gathering through the TaskList will fully utilise Crafting & Disenchanting searches. The materials list for a particular recipe has been tweaked to ensure text no longer clips and more materials are displayed for a much clearer overview of what a recipe required without further interaction. In addition, you can now shift click items in and outside of your Crafting UI, such as the material list or your bags, to filter your recipes, link in chat or search on the Auction House. Searching the Crafting UI by a material now also returns all crafts that uses that particular material. For example searching for ‘windwool cloth’ in your Tailoring profession will no longer simply return ‘Bolt of Windwool Cloth’ but also any crafts that require that item. 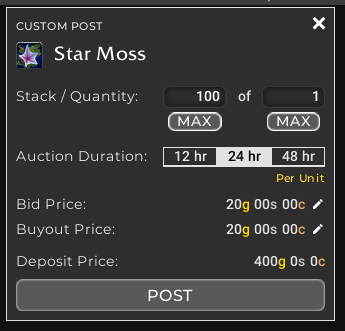 With the recent changes to the Auction House and an increased deposit fee of up to 20% on trade materials or crafting reagents, we’ve added the total deposit fee you’ll pay based on your auction buy out to the interface when you’re posting via the Auctioning or Shopping tab. This’ll help you better keep an eye on how much you’re spending to post your items and draw attention to when you could be spending too much to post certain stack sizes. What better way to find out you’ve made a sale than to hear the satisfying ‘ka-ching!’ sound after someone buys your listed item. The option to enable the audible sale notification has been introduced in the Auctioning Settings. The Ledger has been updated to have finer control over individual records, you can now delete a purchase or sale entry at the item detail level by right clicking. 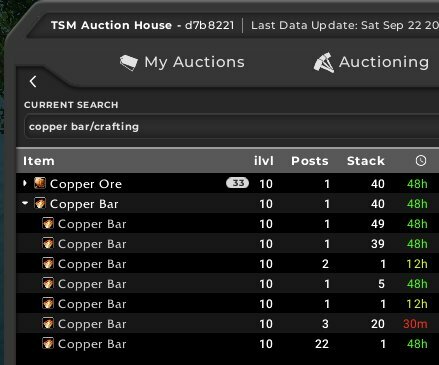 Milling, Prospecting and Disenchanting data for Battle for Azeroth items has been added to TSM. Your tooltips will be more accurate and show what you can get by destroying a particular item.